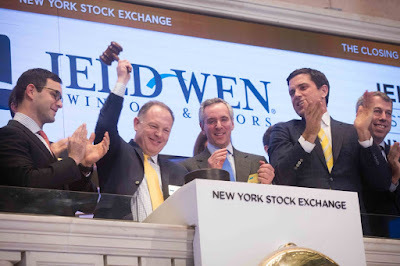 Shares in JELD WEN, one of the world's largest door and window manufacturers which has its UK head office and a manufacturing facility in Rotherham, have begun trading on the New York Stock Exchange (NYSE). The initial public offering (IPO) of the common stock of JELD-WEN Holding, Inc saw the US firm raise around $600m as 25 million shares began trading last week. JELD-WEN is one of the world's leading manufacturers and distributors of quality timber windows, external and internal doors, patio doors and stairs. As it launches on the stock exchange, JELD WEN, which moved its European headquarters to the UK, warns that the effects of Brexit could inhibit the growth of the business. The Woodhouse Mill site, which is one of the biggest employers in the area with over 400 members of staff, operates as the UK head office and also houses a door manufacturing site - producing almost two million doors per year for UK distribution. It received some £4m in investments in production facilities in 2015. Growing from an Oregon millwork plant with 15 employees, today the company spans across 22 countries in North America, Europe and Australia. JELD-WEN comprises of approximately 150 divisions employing more than 20,000 people. The slowdown in the construction sector following the global economic crash saw private equity firm, Onex Corp., invest around $900m from 2011 for an increasing percentage of the business. It is being reported that Onex will use the IPO, which values JELD WEN at around $2.4 billion, to sell its 84% stake. Documents filed as part of the listing state that JELD WEN will use the proceeds to repay debts created when it made payments to common stock holders before the IPO. Proceeds will also be used as working capital and could be used to make acquisitions. Net revenues in Europe, where JELD WEN is ranked as the number on manufacturer in residential doors, increased $24.4m, or 3.3%, to $752.2m in the nine months ended September 24 2016. The company believes that, although construction activity in Europe has been slower to recover compared to construction activity in North America, new construction activity is expected to increase across Europe over the next several years. The filing documents also point to uncertainty caused by the UK leaving the EU. It states: "The effects of the United Kingdom's withdrawal from the European Union on the global economy, and on our business in particular, will depend on agreements the United Kingdom makes to retain access to European Union markets both during a transitional period and more permanently. "Brexit could impair the ability of our operations in the European Union to transact business in the future in the United Kingdom, as well as the ability of our UK operations to transact business in the future in the European Union. If the United Kingdom and the European Union are unable to negotiate acceptable withdrawal terms or if other European Union member states pursue withdrawal, barrier-free access between the United Kingdom and other European Union member states or among the European Economic Area overall could be diminished or eliminated. "Brexit is likely to continue to adversely affect European and worldwide economic conditions, and may contribute to greater instability in the global financial markets. Among other things, Brexit could reduce consumer spending in the United Kingdom and the European Union, which could result in decreased demand for our products. Similarly, housing sales and home values in the United Kingdom and in the European Union could be negatively impacted and Brexit could also influence foreign currency exchange rates. "For the year ended December 31, 2015, we derived 5% of our net revenues from our operations in the United Kingdom, and we have moved our European headquarters to the United Kingdom. As a result, the effects of Brexit could inhibit the growth of our business and have a material adverse effect on our business, financial condition, and results of operations."